This Hot Towel Warmer is suitable specifically for use in Massage Salon or Spa. 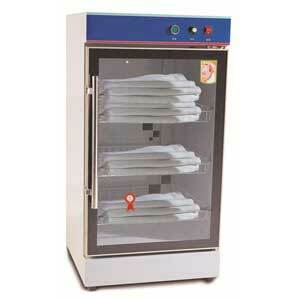 Hot Towel Cabinets - Warmer and UV Sanitiser, 82 Litres. (#CAPK022). Price: incl GST. Add to cart. Suitable for warming larger towels. Thin stainless steel external casing. Unit works best with dry towels. UV sanitising bulb can be switched ON or OFF. This unit does not heat to the same degree as those designed for heating wet towels. External: 45 x 42 x 80 cm (L * W * H). Internal: 42 x 30 x 63 cm (L * W * H). This unit suits larger Towels. These should preferably be dry or mostly dry. If wet then they can be damp but not soaking wet. Delivery of this Massage Towel Warmer can be organised to be sent anywhere within Australia. Online payments processed securely through PayPal. Cards accepted include Visa and Mastercard while bank transfer and cheque also catered for. Any questions you have can be answered by calling (02) 6162 1950 during office hours or send us an email. * All models on this site can be viewed in our Canberra shop.